Uno más de mis proyectos pendientes era forrar piedras con ganchillo. Me gustan mucho y las necesito en mis clases de costura para mantener el papel de patrón sobre las telas. Después de dos meses, ¡sí, dos meses!, sobre mi mesa ayer me puse con ello. 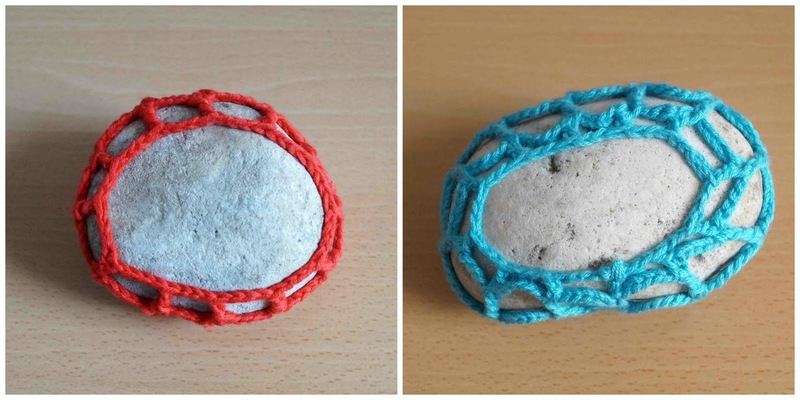 One my pending projects was to wrap stones with crochet. 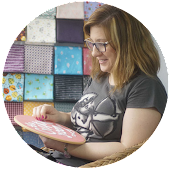 I like them very much and I need them in my sewing classes to keep the paper pattern onto the fabrics. After two months, yes, two months!, on my table yesterday I started with it. El patrón que os propongo es muy sencillo, de forma que se puede adaptar fácilmente a cualquier piedra. Trabajamos con puntos altos dobles y cadenetas entre ellos, cuyo número aumenta a media que lo hace el contorno de la piedra y disminuye en el momento en que empieza a menguar la piedra. Si al reducir cadenetas se sigue quedando holgado, sustituid los puntos altos dobles por puntos altos. The pattern that I propose you is very simple, so that it is possible to adapt easily to any stone. We work with double crochet and chains between them, which number increases as the edge of the stone does and decreases when the stone starts decreasing. If when decreasing chains still hangs loose, replace the double crochet with treble crochet. Por debajo no las he forrado para que tengan más estabilidad. I have not wrapped them underneath so they have more stability. Tejer una cadeneta base de 10 cad y unir con un pr. Vuelta 1: 5 cad, *1 dpa, 1 cad* (repetir * * 11 veces), pr. Vuelta 2: 6 cad, *1 dpa, 3 cad* (repetir * * 11 veces), pr. Vuelta 3: 8 cad, *1 dpa, 5 cad* (repetir * * 11 veces), pr. Vuelta 4: 6 cad, *1 dpa, 3 cad* (repetir * * 11 veces), pr. Vuelta 5: 5 cad, *1 pa, 3 cad* (repetir * * 11 veces), pr. Chain 10 and join with a sl st. Round 1: 5 ch, [1 tr, 1 ch] 11 times, sl st. Round 2: 6 ch, [1 tr, 3 ch] 11 times, sl st. Round 3: 8 ch, [1 tr, 5 ch] 11 times, sl st. Round 4: 6 ch, [1 tr, 3 ch] 11 times, sl st. Round 5: 5 ch, [1 dc, 3 ch] 11 times, sl st.
Podéis descargar el patrón en PDF aquí. 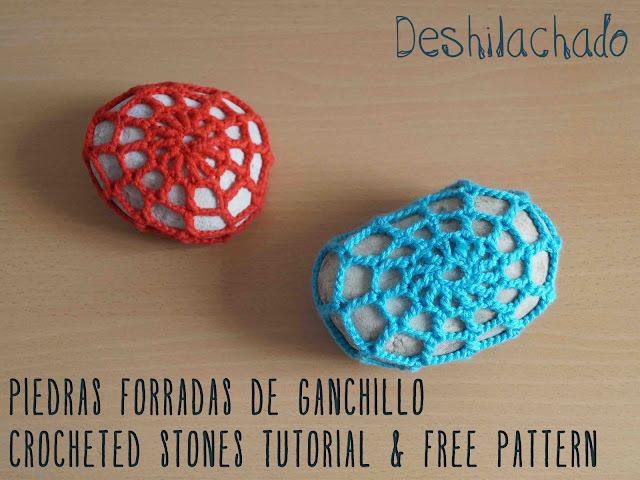 You can download the free pattern on PDF here.